In 1970, Japanese roboticist Masahiro Mori remarked in 1970 that, as robots become more humanlike in appearance, people will respond more positively. However, a point will be reached where people will be strongly repulsed; acceptance will fall. This uncanny valley (seen if you plot acceptance versus increasingly humanoid appearance), is of great concern to those who would like to see humanoid robots play a greater role in our daily lives. In a recent study conducted by Ayse Pinar Saygin, an assistant professor of cognitive science at the University of California, San Diego, twenty test subjects were shown videos of the Repliee Q2 android. 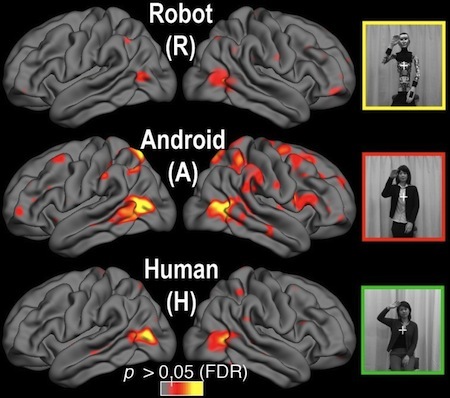 As they did so, their brains were scanned using a functional magnetic resonance imaging (fMRI) scanner, which revealed significant differences in the way they viewed the android, a metallic robot and a person.